This is a recipe from my high school vegetarian years. You know the ones I talk about. You might’ve had them, too. I kinda came up with several pretty good recipes back then. Not necessarily low-fat or low-cholesterol, since they were all super cheese-heavy, but what do you expect from a 15 year old vegetarian? I needed sustenance, by golly! I’ll probably pay for it with heart disease later, but if I get osteoporosis, you can bet I will be PISSED. Anyway, it’s really simple and there’s no boiling noodles first which I like because it means one less pot to clean and saving water for whales. Dolphins, too. Fish. Sharks. Crabs. Anemones. They all need water way more than this lasagna. So let’s do them a favor, eh? At the bottom, I included the recipe for the (also super-easy) marinara sauce that I used in the video. I learned how to it make from a Real Italian. Cool, right? You could totally use a jar of sauce. Heat the oil over a medium-low heat and add the garlic. Cook just a few minutes until the garlic smells up your kitchen. Add the tomatoes and stir. Put a lid on the pot and simmer 15 minutes. Use a spoon to kind of break up the tomatoes, mashing them against the sides of the pot. Add the basil and simmer another 5 minutes with the lid off. Taste. You might want to add a little salt if you used fresh tomatoes or canned, no-salt tomatoes. Combine sauce and water in a large pot or bowl. In another bowl, mix ricotta, mozzarella, half (1/4 cup) of the parmesan, the egg, and the herbs and pepper; combine well. Lightly oil a 9” x 13” baking dish. Pour in about a cup of the sauce/water combo. Lay 3 lasagna noodles (uncooked) over that. Layer a third of the cheese mixture on them, then a third of the mixed vegetables. Pour another cup of sauce over and 3 more noodles. 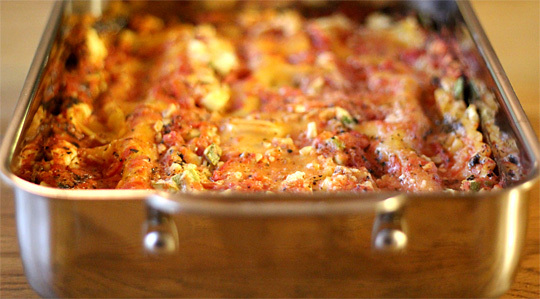 Repeat layers of cheese, vegetables, sauce, and noodles, ending with sauce. Sprinkle with the remaining 1/4 cup parmesan. Cover with foil and bake at 350º for 45 minutes to 1 hour, until the noodles have absorbed the liquid. Remove foil (carefully!) and cook 15 minutes longer. Strict vegetarians will need to ensure their cheeses aren’t made with rennet, an animal product. Vegetable rennet cheeses are available. Search online for retailers. Love the episode! I now have something to cook for my vegetarian friends. You rock as always. Thanks, Scott! I hope you enjoy! Tuesdays have become “Lunch with Hilah” day with me as I watch each new show while I eat lunch. Thursday was Lunch with Hilah again, sort of: the lasagna I made Tuesday was just as good reheated for lunch today! Randy, you have no idea how happy it makes me to picture you watching the show while you eat lunch on Tuesdays. That alone is inspiration enough to make sure I NEVER miss a Tuesday! And, yay for lasagna leftovers! And thanks for answering my nagging question about the no-boil noodles–I’ve never been willing to take the risk to experiment. It just seemed too high-stakes. Oh, and your dress in this video is totally hawwwwt! hi hilah. to make it meaty would i just add meat to the sauce and cook it the same way? Exactly, Garrett! That would work great! Roomie in college made this no boil lasagne in college. His Mom taught him this and it was the only thing he could cook. Dude had a campus meal plan after moving off campus, at a school with the worst institutional food anywhere ever, Cal Poly. Hey, at last now they have a Chick-fil-A. Cal Poly prevented Micheal Pollan from speaking on campus due to threats of retaliation from Harris Ranch. Dang! Did they really? That’s crazy. Quick question: when reading the directions I saw that it called for 1/2 a cup of parmesan, so when I was making the cheese mixture, I used the 1/2 a cup. Then I saw I was only supposed to use 1/2 of the 1/2 cup – gulp. Please tell me this wont ruin my lasagna. Oh gosh, no, Poetshyne! You’re fine. I’ll fix that to be clearer when I get a chance. Hope you enjoyed it! Just made this for my family that think all vegetarians eat is salad. Six months without meat and three years without soda and I feel amazing!! I really meant to make this, but the ghost of Grandma DiDanato wouldn’t let me, so I made the old standar, but thanks for the inspiration. This is kind of how I tell everyone to cook lasagne. Don’t cook the noodles. I usually just put it all together with the sauce and fillings then add an extra cup and a half of water, cover with foil, cook 45 minutes at 350 degrees, then take the foil off, top with cheese, and good to go. Usually do three layers with that combo. After cheese I cook for 15 or so more minutes, until it’s looking good. Yes, it’s a great method! Just made this for a friend I haven’t seen in a long time. Such a delight, thanks Hilah!